Enjoy this exclusive package of Robot Cabaret show ticket and dinner at the Samurai themed Restaurant in Shinjuku. Discover the excitement of a robot entertainment show with neon lights and catchy dance music, including a prix fixe menu of various Japanese dishes at a uniquely decorated restaurant. This package includes access to a show at the Robot Restaurant and a dinner at Sengoku Buyuden (Samurai-themed) Restaurant. You can first go to dinner and then see the show, or vice-versa (depending on the option you select at the booking - please see the Important Info tab for details on these options). The two venues are only five minutes apart on foot. *The course includes one drink (beer, wine, or non-alcoholic). 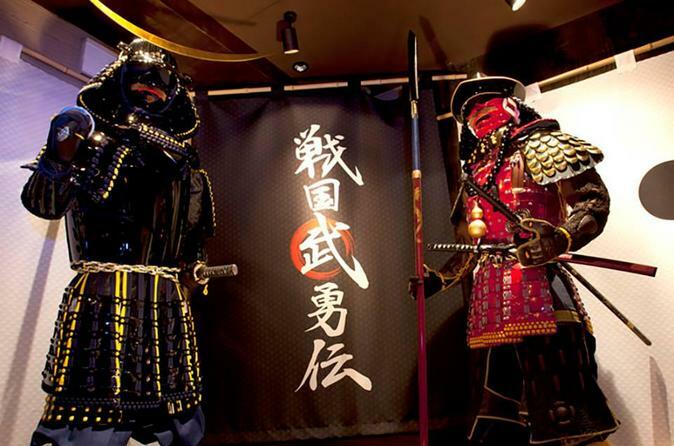 The restaurant is prepared with private rooms where you can experience living the life of Japanese warlords. At the entrance, three custom-made pieces of armor are displayed. One of Yukimura Sanada, whose many heroic deeds during the Warring States period are still talked about today, another of Masamune Date, an enemy general of Yukimura Sanada at the Battle of Domyoji in 1615, and a third piece of armor of Keiji Maeda, one of the most celebrated Kabukimono, or “wild men” of his time. One of the most popular rooms of the restaurant is the "Honnoji-temple Jigokuhen" room, which is decorated mimicking the temple, Honnoji, where the warrior, Nobunaga Oda, was forced to commit suicide. The room which creates the atmosphere of a fierce battle and has seating at the counter named after the warrior Nobunaga Oda, as well as two box seats named after Mitsuhide Akechi, who is known to have raised a rebellion against Nobunaga Oda and Ranmaru Mori, who was Nobunaga Oda’s ally. As Oda Nobunaga place of rest, Teramachi-Oike became a famous historic site of the battle between Nobunaga Oda and Mitsuhide Akechi.